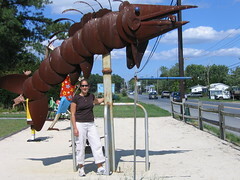 As with most of the roadside attractions we visit, when we saw that Millsboro, Delaware was a smallish town on the map, we decided to find the crazy metal sculptures without any more research than our trusty AAA map. We generally figure we'll run into it (not that it always works seamlessly. . . (see "World's Largest Umpire", Ryan, Iowa). We headed down the road after a busy morning at the beach with the kiddos (who were snuggled down for their naps. . . hopefully). Speeding along the "major" road between the coast and Millsboro, we nearly sped by our attraction. As a giant collection of creatures, flowers, and cartoon characters (all made of recycled metal) came into view, we screeched to a stop and bombed off the road. There were no people in sight. No "enter here" sign. But then again, there was no "keep out" sign either (which would rarely deter us anyway), so we clammored about the metal behemouths snapping photos and posing with the giant metal "Spongebob Squarepants." A house, barn, and some outbuildings were toward the back of the property and the driveways and roads that snaked through it were lined with metal sculptures, so we kept walking and finally found signs of life. 2nd Time Designs is run by Lou and Judy Hagen and we stumbled upon Judy working in the studio, so she invited us in. There we saw works of art in progress as well as more finished pieces and some great articles about their creations. Lou and Judy are also long-distance truckers (hauling produce) and began sculpting as a change of pace. Their pieces are unique and beautiful. 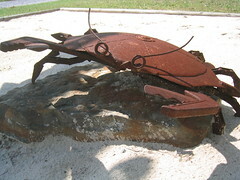 You would never know that old scrap metal could look like a flamingo, or a turtle, or a fish. Their pieces are all painted and sealed to display outdoors year round. We spent far more time than we anticipated looking at the sculptures and highly recommend a stop by if you're in the neighborhood.